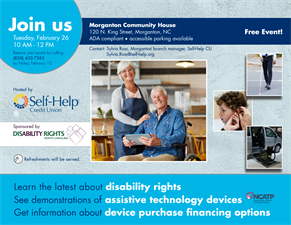 You are invited to attend a free event at the Morganton Community House on Tuesday, February 26. This educational event will start at 10 am, and end at 12 noon. The Morganton Community House is located at 120 N. King Street. The location is ADA compliant, and accessible parking is available. Refreshments will be served. Several guest experts will be in attendance. Learn the latest about disability rights. See demonstrations of assistive technology devices. Also get information about device purchase financing options from Self-Help Credit Union. This event is hosted by Self Help Credit Union and sponsored by Disability Rights North Carolina. 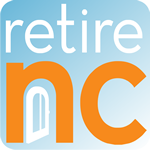 Device demonstrations will be conducted by the North Carolina Assistive Technology Program. 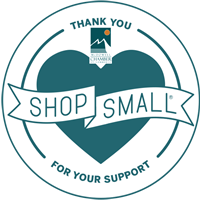 Call the Morganton branch of Self-Help Credit Union at 828 433 7383. Please let us know of your accessibility needs when you call to RSVP. Please call to reserve your seat by Friday, February 15.